Fischer beer garden is located in Stegen directly on the northernmost shore of Ammersee 38km from Munich. On good days guests can enjoy great views over the lake with the alps in the background. Fischer beer garden is different to a traditional style beer garden. The self-serviced area with about 300 seats does not only have conventional beer garden benches but also a beach corner with rattan chairs and sand floor as well as cushie lounge chairs and round stone tables. The self-service area is mostly shaded by large chestnut trees. What is normally a food stall in a traditional beer garden is here named Beach Bar and in addition to solid Bavarian food, Fischer also offers exotic dishes such as Red Thai Curry, Asian finger food, Salads with falafel and daily fresh soups. The serviced area is located on an elevated terrace below giant trees. The beer served is Augustiner and a Maß costs €7. 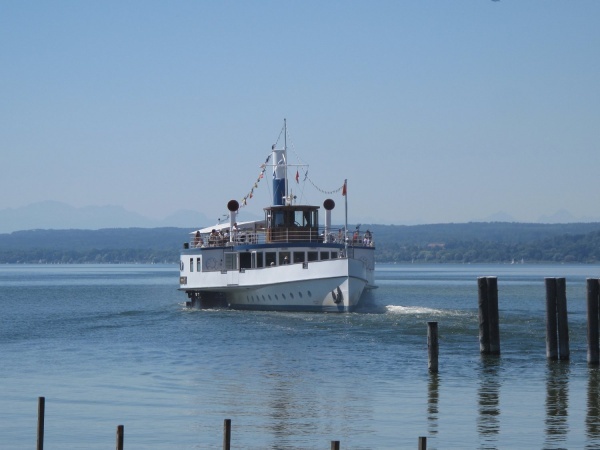 The beer garden rents out small rowing boats but for those who want to see the Ammersee without exercise can jump on the Dampfer (an old steamboat criss-crossing the lake) leaving from the pier right in front of the beer garden. The more adventurous can jump in their own dinghy and float relaxed along the Amper river from Stegen to Fürstenfeld Bruck (takes about 5 hours / 16km). While the beer garden has a "beach bar" and a (artificial) sand corner, there is no real sand beach. The Ammersee has mostly pebble stone beaches, it is a beautiful lake and a great place for swimming anywhere. The beer garden is open from Monday until Friday from 11am until 11pm and on good weather weekends and public holidays from 10am until about midnight.